History of this Tajik family in Russia began 7 years ago when the four brothers first came to the Volgograd region and rented a plot of land. Everyone who knows them calls them hardworking men indeed. Back at home, the brothers handled fields of cotton in the vicinity Dushanbe and the experience and skills came in handy in Russia. This large family of more than 30 includes specialists in various fields. One of the brothers is a certified agronomist. The brothers bought two houses in the Volgograd region and brought their wives with children (five in each family) from Tajikistan two years later. "I weep every time I recall how we bid farewell to our parents. They were so reluctant to let us go. Still, what could they - or we - do? Our men were here," one of the brothers' wives said. The families spent the following three years in their own spacious houses in a large village. A conflict with another tenant farmer, however, compelled them to move to another district. Three brothers and their families live in a small village, and the fourth some distance from it, now. They rented apartments in four-floor buildings and repaired them with their own hands. The brothers cultivate tomatoes, cabbage, and even watermelons on 70 hectares of land. They even have a tractor. All members of the family work the fields so as to hire as few outsiders as possible. The land they managed to rent is bad (salty), and some crops wither. The family bred sheep at first (it has a cow now). The crops are mostly sold wholesale. Home-made pickles are sold at the marketplace in the nearby town of Volzhsky. Guests and visitors are treated to flat cakes. Generally speaking, the family is known for its hospitality and warm relation with the Russian neighbors. The family in question is from Dushanbe and its environs. One daughter-in-law has an apartment there, another a house in the outskirts - with lots of relatives. The last visit to Tajikistan was made two years ago. The family planned another trip to Dushanbe this summer (for a wedding), but the yield turned out to be disappointing, and the trip was postponed. The youngest daughter-in-law finished typewriting school in Dushanbe. Once a librarian there, she speaks flawless Russian. The eldest daughter-in-law married early and that interfered with her education plans. 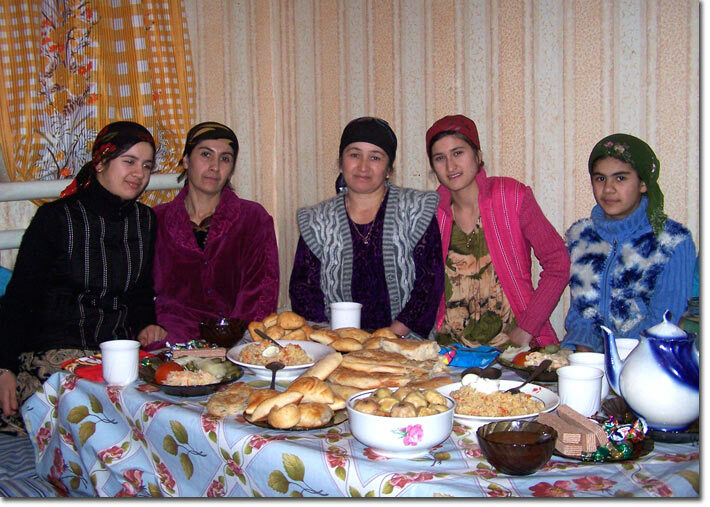 All Tajik ways and traditions are strictly observed in the family. I was accompanied by a man, and we were received in different parts of the household - one restricted for men, the other for women. Finding myself in the traditional household was nice. A PC in the corner certainly stood out against the background of traditional rugs and slippers. It is reserved for kids whenever they want to play, watch a movie, or listen to some music. Younger children go to school. Daughters, who are several years older, do not. "When we came here first, our girls were supposed to attend the seventh form," one of the women explained. "Unfortunately, they did not speak Russian and had no friends here. They were shy to go to school... And why bother? They'd better think about marriage." Kids encounter no problems at school. In the village, however, there were problems at first. "Everyone there was so arrogant then. Probably because it was a large village," the woman continued. Asked about marital traditions, I was told the following, "It's not the way it was in the past when everything was arranged by parents alone. After all, the future man and wife should meet each other before the wedding. Not like it was in the past when the bride first saw her groom only at the wedding. That's how it was for me," one of the women said. All the same, girls are certainly taken care of. They are not even sent to the nearest store. Either they are at home or work the fields. Girls are not permitted contacts with Russians or even with Tajik hired hands. The family does not intend to leave Russia. Its members already have the provisional permit and count on getting residence permit and eventually citizenship soon. As for their work here in Russia, this is what an official of the Tajik Ministry of Labor told this correspondent, "Who is going to develop Russian agriculture? The Russians will never work with such abandon. It's people like this family that should be supported first and foremost."